Mining and resource extraction have played a major role in the economy of Routt County since its early history, with waves of production through the decades based on advances in transportation and technology, market conditions and trends in national energy usage. Mining has occurred in Routt County in some form since 1866 when gold was discovered at Hahns Peak. The history of coal mining in Routt County dates back to the 1880s and 1890s, when coal was mined in small quantities by hand and carted by wagons. Area coal production grew after the arrival of the railroad in Steamboat Springs in 1909 and continued from 1910 to 1943 for residential, industrial and railroad engine uses. Coal mining in the area declined significantly by 1945 with changes in national energy use but increased again with the use of coal in large electrical power plants in the 1960s and the national energy crisis in 1970s. Today’s coal mining operations utilize sophisticated equipment and ship by long coal trains to utility and other customers. The Twentymile Mine, owned by Peabody Energy, is an underground mine located on approximately 40 square miles in the Yampa Coal Field of the Uinta Coal Basin. It operates with longwall panels that are 1,000 feet wide and more than two miles long. A conveyor belt travels more than five miles underground and two miles on the surface. The Twentymile preparation plant is the largest of its kind west of the Mississippi River. Twentymile Mine is served by the Union Pacific Railroad and typically loads one to two unit-trains every day. Each unit-train has 100 to 115 cars, each carrying 11,000 tons of coal per trip. Twentymile sold 3.2 million tons of low-sulfur steam coal in 2015, and as of 2015, employed 300 workers. Peabody reports that in 2015 the Twentymile Mine injected about $124 million into the regional economy, representing an implied economic benefit of more than $496 million. Coal from the Twentymile Mine has a high heating value of 11,200 Btu per pound and low sulfur, ash and mercury content, which makes it ideal for electricity generation, according to Peabody. It helps to power the local Hayden Generating Station, which employs 105 people. The steam-driven turbine electric generating station operated by Xcel Energy has two units that can produce 446 megawatts of electricity, according to Xcel Energy. The existing facilities at the Hayden station, located 18 miles west of Steamboat Springs, are due to be retrofitted with additional emission controls. The history of oil extraction in Routt County can be traced to the 1920s in the Tow Creek area 20 miles west of Steamboat Springs. After years of exploration, the first paying well was drilled by Texaco in 1920, according to The Historical Guide to Routt County. The first oil shipments by rail started in 1925, and by the early 1940s, 33 wells in the area were producing 86,000 barrels annually, according to the historical guide. In August 2012, Routt County had 24 producing wells, according to Colorado Oil & Gas Commission reports. Although natural gas production has been significant in counties to the west, natural gas in Routt County has been produced for more than 50 years in relatively limited quantities, according to the Colorado Geological Survey. Renewable energy resources such as solar, biomass and geo-exchange are available to harness with the help of local installation companies. Small wind power and hydropower systems also have been established in the area at site-specific locations. The Upper Yampa Water Conservancy District manages the 800 KW capacity Stagecoach Dam and Hydroelectric Plant on Stagecoach Reservoir south of Steamboat Springs. The power is sold to Xcel Energy through the local Yampa Valley Electric Association infrastructure and provides enough electricity for up to 800 homes per year. Two other hydropower projects in Routt County currently are in the permitting process, a 695 KW system at Catamount Reservoir just south of Steamboat and a new 392-acre reservoir and hydropower plant by Peabody Energy in the Trout Creek area 15 miles southwest of Steamboat. Winter snows do not stop the sun from providing effective power for solar electric systems in Routt County. Local installers have completed commercial building systems at locations ranging from the Routt County Justice Center to Moots Cycles to the North Routt Community Charter School. 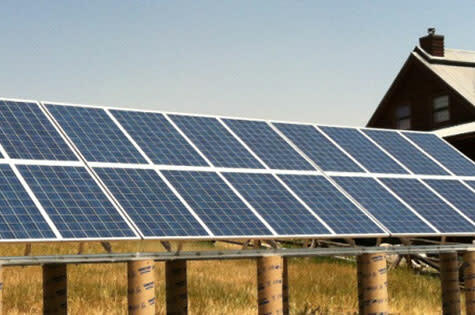 Yampa Valley Electric Association, in partnership with the Clean Energy Collective, offers customers the option of purchasing shares in a solar garden located in Craig, Colorado.